THINGS got controversial at the Save Our Swimming Pool campaign fund-raising quiz the other night. It was the picture round. No one could figure out who the angry-looking man in the grainy photograph was. One person – who I will not name (yet) – swore that it was Harrison Ford. It wasn’t. A meeting of residents at Dolphin House, organised to highlight the living conditions in Dublin Corporation flats, was told this week that that UN standards on housing are being breached in Dolphin House. 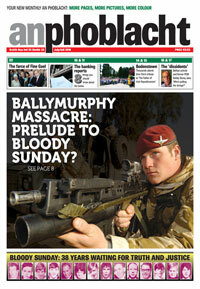 By now, many of our readers will know that An Phoblacht will launch as a new monthly on 24 June. The paper is adapting, like most print media, to the phenomena of online media and is also changing its format - the new monthly edition will be crammed with interesting features, interviews and analysis. This edition will complement the vastly improved, dynamic web presence. Sinn Fein hosted a delegation from Cuba at the annual Cairde Sinn Fein in Belfast at the weekend. The delegation joined over a thousand guests at the Europa Hotel for the evening event. 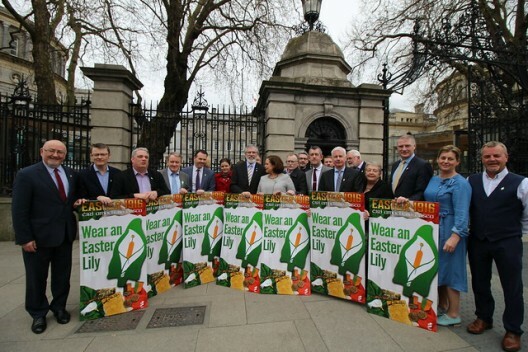 The group had met the Sinn Féin TDs in Leinster House earlier in the week. Where are the Luddites when you need them? 'AN PHOBLACHT' began publishing as a monthly, I think, in 1970, around the same time that the Belfast-based 'Republican News' came on the streets. Sinn Féin’s ‘Jobs for the Unemployed’ campaign saw the delivery of over 16,000 postcards to Government buildings in Dublin on Wednesday. The postcards demand action on creating jobs and were launched by the party earlier this year as part of an extensive campaign on unemployment. GERRY ADAMS has told Sinn Féin's National Youth Committee meeting in Dublin's inner city that the Government is doing nothing to address youth unemployment while Sinn Féin has set out proposals to get 50,000 under-25s off the dole, including a specific youth jobs fund to create 20,000 new jobs. If you are a Premium Service subscriber, click here to view the full An Phoblacht Archive in PDF Booklet format or sign up for our Premium Service for only €10 per year.